I had the opportunity to interview Meghan Sebold, Designer and President of AFIA, and I was so inspired by what she is doing. AFIA is a sustainable womenswear clothing line that recently launched its second collection. Like a seasoned pro, though, Meghan is a master at predicting trends and translating these into wearable, unique, fun clothes. What sets Meghan’s line apart from the thousands of other clothing lines out there? AFIA uses fabric made in Ghana and the clothes are sewn by a sewers co-op in Ghana. The result is a collection of cute items that celebrate the West African culture with strong prints, while aligning with American trends. Read on to find out more! LATB: What inspired you to start AFIA? MS: I was an econ and international relations major and to satisfy the right side of my brain I studied in Ghana in 2006 to research the textile industry. I fell in love with the vibrant textiles. All the ladies in the group I was with would spend hours in the busy, hot markets – we’d buy a few yards and take it to a seamstress with a sketch. I returned to the US with a custom wardrobe. That got me inspired – I literally started dreaming of dress designs at night. I saw how I can translate the textiles into American trends to create a really unique style. On the economics end of things, the textile industry has two major challenges: 1) The authentic textiles printed in Ghana are being imitated by foreign countries, smuggled into the country, and sold at lower prices. This has crippled the Ghanaian companies leaving only a few left. These fabrics are so iconic and historical to Ghanaian culture, and I want to support those textile companies that are still hanging on. 2) The market is oversaturated with very skilled seamstresses and tailors and there’s not enough work to go around. AFIA provides work that opens them up to the American market. LATB: Who is the AFIA woman? MS: She is a youngish trendsetter and taste-maker with a global perspective and desire to make decisions that affect people and the planet positively. LATB: Tell us about these women in Ghana who make the clothes for the line. MS: Our first collection was produced by the Dzidefo Women’s Sewing Cooperative in the small village of Kpando, 5 hours from the capital city of Accra. It’s very much their own co-op and they get all the profits, there’s no outside force directing them. There’s about 8 women. It’s a good space-they can bring their kids in. They have various roles – cutting, sewing, overlocking – and you can train and move up to other positions over time. The power goes out so frequently that they work with hand-powered machines-the beautiful black and gold antique-looking ones. They have an overlock machine that makes the edges super tight- they have to knock out all this work when the power is on. The cooperative is in the same building as the RayBanz Mia orphanage. Mama Essie, the best cook in Ghana, runs the place, which has between 15-20 children. There are 7 other orphanages within miles of this one (whoa). LATB: Where do you see AFIA going in the next few years? MS: We are expanding to brick and mortar stores across the country so that our customers have the opportunity to touch and feel our pieces. We also get a unique amount of interest from Australia and New Zealand so we’re going to make a trip there. We’re going to grow, but you won’t see us moving production to China to cut labor costs. We’d like to go on a sustainable living roadshow in an airstream next summer with some other brands, and stop at festivals and events in cities. Wouldn’t that be a dream? It would be a great way to get in front of people who support our brand and spread the word more, which is really what it’s all about. LATB: As a designer, which celeb would you like to dress? MS: MIA, Cat Power, Santigold, Florence Welch, Feist, Stevie Nicks, Kate Hudson, Mary Kate Olsen, Sienna Miller. 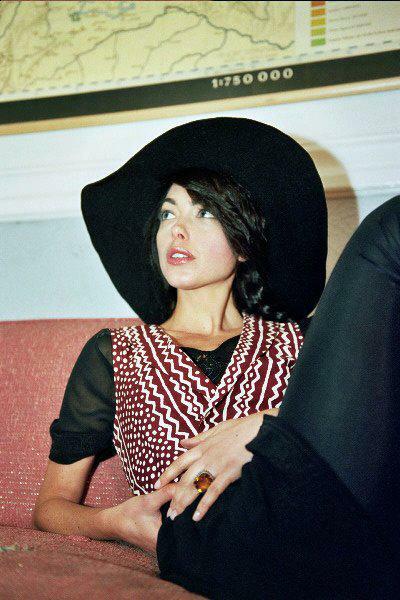 We’re dressing Estelle soon and indie rock goddess, Nicole Atkins. LATB: What’s the hardest part about being a ‘sustainable’ designer? MS: You can’t please everyone under the “sustainable” umbrella – you have to pick your battle and stick to it. AFIA is fair trade and fair wage; we focus on creating economic opportunities to improve quality of life, the human impact, supporting and developing the textile economy of Ghana. To those who say there’s no excuse to not being completely environmentally-friendly i.e. using certified organic fabric, I say, there is a big excuse: poverty. First things first: keep the textile industry in Ghana from going under. Provide skilled seamstresses with orders so they can send their kids to school and pay for medicine. We’re all doing the best we can to make a business with a positive impact. LATB: What’s the craziest thing you’ve ever done for fashion? MS: How about light-up high tops, cutoff jean shorts, a neon graphic tee wrapped around those plastic heart-shaped clips, a side ponytail, and stick-on earrings? I’d wear that everyday if I could! I checked out the new collection and it’s chockful of peplums, neons and funky prints so you’d be right on trend with these items. I am obsessed with the Cave Dweller skirt. Something about an uber short skirt sitting on the natural waist, done in a delicious print, really screams summer chic for me. The fact that Meghan hand-picks these fabrics herself brings more meaning to each piece. To see the rest of this collection or to learn more about Meghan and her partner, Elizabeth, go to www.shopafia.com.